Novak hits a 39yd FG. #Chargers 6, #AZCardinals 3 with 14:40 left in Q2. Thomas Keiser jogged back to the sideline. Looks like he's okay. Two tackles tonight by undrafted rookie free agent Greg Ducre on kickoffs. Hot damn. Derek Carr is throwing some dimes out there. Chargers had 7 yards rushing in the first quarter. Another FG. #Chargers lead 6-3. Someone needs to explain to these coaches that they have NOTHING to lose by going for it on 4th down. After #AZCardinals punt, the #Chargers take over on own 8. SD 6, AZ 3 with 13:39 left in Q2. Qualcomm playing highlights of GB destroying KC. Fun. I think this is the first time Kellen Clemens has been the best player on the field since he went to Oregon. Sweet grab by @JavonteeHerndon ! Marion Grice has already outperformed Branden Oliver tonight. By a lot. We believe Javontee Herndon was already going to make practice squad, but he just sealed that with a leaping, adjust-in-air, 22-yard catch. Tevin Reese gets open downfield often. 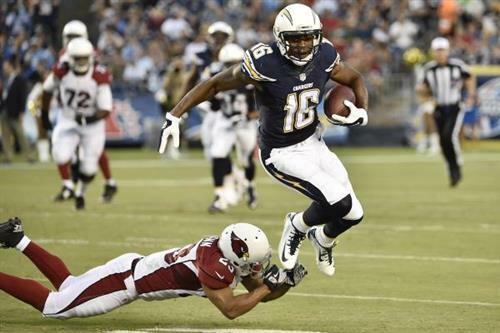 Seyi Ajirotutu needs to make this #Chargers team, if only because he has the best name in football, nay... in sports. Nick Novak just clears the crossbar from 55 yards out! 9-3 Chargers. Nick Novak booms a 55yd FG. #Chargers 9, #AZCardinals 3 with 7:56 left in Q2. Nick Novak muscles up, good from 55 yards out to give Chargers 9-3 lead with 7:56 left in the half. Young Chargers RB Marion Grice ran 6-35 on that drive followed by Novak 55-yd FG. Novak 3-3 and SD leads 9-3. Marion Grice has some elude. Best we've seen from him this month. Preseason or not… I believe that was a career long for #Chargers kicker Nick Novak at 55 yards. Wow, you guys really hate Tevin Reese. Good to see Walt Powell running hard on KOR. #AZCardinals take over on own 46. Novak just hit a 55-yarder to make it 9-3. Would Mike McCoy get fired if he went for it there on 4th & 10? Why waste your time with a FG? D-Line makes some noise. Cordarro Law with a huge hit on Logan Thomas, forcing a fumble recovered by Tenny Palepoi. Cordarro Law with a sack fumble. Also a pretty good special teams player. Might have to find a spot for him. Gotta say it's pretty cool how the Chargers veterans congratulated the defense coming off the field after a takeaway. They're into the game. QB Logan Thomas gets destroyed on a sack and fumbles. #Chargers recover on #AZCardinals 47. If I had to make a list of five things I never want to experience, No. 1 is being at the bottom of a pile during a fumble. Sweet Moses. Same old Chargers. Piping in fake crowd noise for a preseason game.